While struggling as a young actor in New York, John Forsythe worked at Ebbets Field as an announcer for the Brooklyn Dodgers. After some live television work on soap operas, he came to Hollywood and made his film debut with a small role in Cary Grant's Destination Tokyo. In his more memorable film roles, Forsythe published a small-town newspaper with Loretta Young in It Happens Every Thursday, helped bury and dig up and re-bury a corpse in Hitchcock's The Trouble with Harry with Shirley MacLaine, tracked down killer Robert Blake in In Cold Blood, and was held hostage by juvenile delinquent Ann-Margret in the drive-in classic Kitten with a Whip. But as Hitchcock told him, Forsythe was more cut out for television than films, and it was on the small screen that Forsythe made his mark. He appeared in numerous episodes of 1950s anthologies like Studio One and Climax!, while starring on Broadway in The Teahouse of the August Moon. From 1957 to 1962 he starred as the titular Bachelor Father, raising his niece with the help of his Chinese manservant. The show had the distinction of running on all three networks -- two years on CBS, then two years on NBC, then one year on ABC. 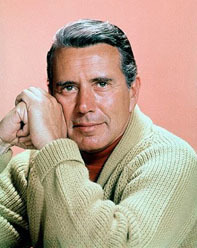 In his second sitcom, The John Forsythe Show, he ran a private school that also served as an operations base for bumbling spies, and in his third sitcom, To Rome With Love, he played a single father teaching in Italy. The role of Dynasty's Blake Carrington originally went to George Peppard, but producers recognized their mistake after a few days' filming. Carrington was occasionally written as an underhanded J.R. Ewing-esque cad, but Forsythe saw his character as a good guy, and would occasionally remind the writers that he was playing the lead, not the villain. Earl Blackwell's Entertainment Celebrity Register described Carrington as "capitalism's most attractive symbol". For his work on Dynasty, Forsythe won two Golden Globes and one Soap Opera Digest Award. He also became the frontman for Carrington Cologne, a scent based on his Dynasty character. After Dynasty, Forsythe starred as a wacky senator in the short-lived sitcom The Powers That Be, and hosted the syndicated I Witness Video. He also provided the voice of the secretive boss on Charlie's Angels, literally phoning in his performance. In retirement he served as spokesman for the World Wildlife Fund, and reprised his phone-in role as Charlie for Drew Barrymore's Charlie's Angels movies. While battling cancer he died of pneumonia on 1 April 2010, 92 years of age.